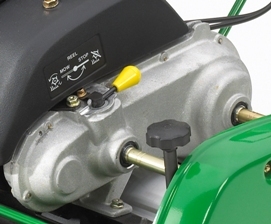 The engine on/off switch is located on the front cover for easy access. The on position is forward, while the off position is backward. The park brake lever is located to the left of the operator station. To disengage the parking brake, push the lever forward. To engage it, pull the lever back. 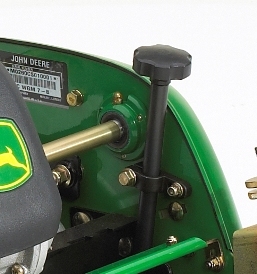 The throttle and clutch levers are located to the right-hand side of the operator station. To increase throttle, push the throttle lever forward. 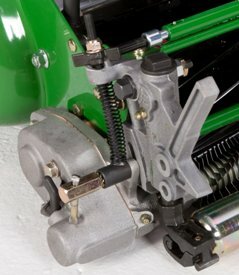 To engage the clutch, hold down the operator-presence bail and push the clutch lever forward, always starting out at low throttle and increasing the throttle to increase to desired speed. To release the clutch and stop the machine, simply release the operator-presence bail. The engine will remain running. 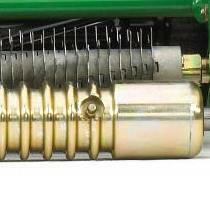 The reel engagement lever is located on the differential gearcase. To set up reel engagement, rotate the lever to the forward position. For transporting, rotate the lever to the rear position to keep the reel from rotating. 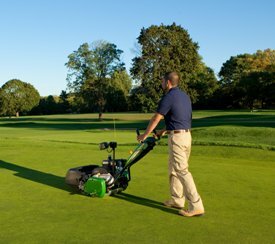 The SL Series Walk Greens Mowers lineup features a standard oil drain channel on every machine. 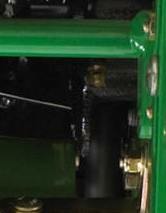 The oil drain channel is located at the rear of the engine, just above the rear frame. 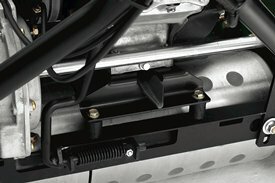 The oil drain channel allows quick and clean oil changes. 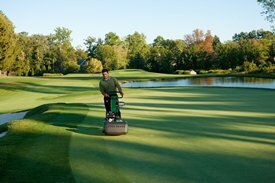 The 180SL, 220SL, and 260SL Walk Greens Mowers meet American National Standards Institute (ANSI) B71.4-2004 standards, which require an operator-presence system. 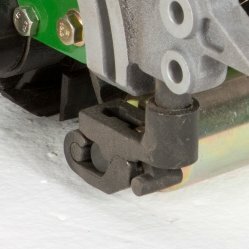 The standard operator-presence system features a spring-loaded bail mechanism to control machine traction. To engage traction, depress and hold the operator-presence bail against the handlebar and engage the traction clutch with the engine at low throttle. To disengage traction, release the operator-presence bail and the traction clutch lever automatically disengages. 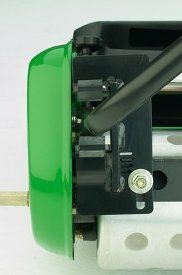 The operator-presence bail is formed to allow the operator to easily fit the bail against the handlebar in virtually any hand position, including operators who mow by lifting up on the handlebar while mowing to reduce operator influence on the cutting height. 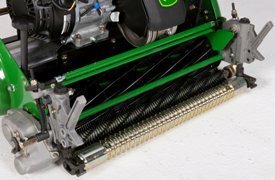 The bail easily accommodates loop-style mowing grips by fitting neatly between the thumb and forefinger. 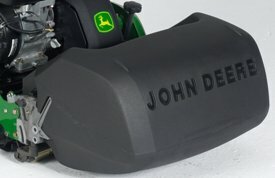 The bail design also allows easy turning at the end of a mowing pass. The loop-style handlebar itself provides several comfortable grips for a wide variety of operators and grip styles. 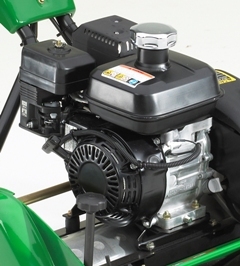 The lower part of the handlebar closely resembles traditional T-handle walking greens mowers. The loop handlebar is also wrapped, allowing a strong but comfortable grip. 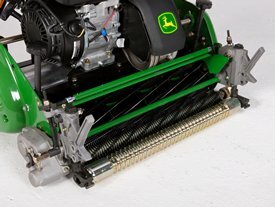 The handlebar system is forward mounted, reducing operator influence on the effective cutting height without sacrificing easy turning. 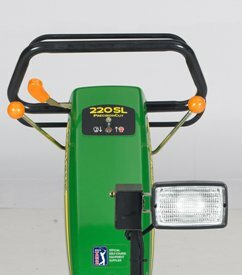 In order to accommodate a wide range of operator heights and operating styles, the handlebar height is adjustable at the rear of the machine. The centers of the adjusters are rubber isolated to minimize vibration of the handlebar, maximizing operator comfort.